In the previous post, we have seen one of the aquaculture commodities is shrimp. This time I will try to write about this subject because shrimp is one of the most popular seafood products and as well as one of the most traded products from aquaculture. Even shrimp aquaculture is currently the fastest growing food production sector in the world. Shrimp is very well known. There are several kinds of shrimp, but I guess what familiar to us are whiteleg shrimp (penaeus vannamei or currently called litopenaeus vannamei), black tiger shrimp (penaeus monodon) and giant river prawn galah (macrobrachium resenbergii de man). White shrimp and black tiger shrimp are actually marine animals but with improvement of technology finally can be done in brackish water. And giant prawn from fresh water, we usually called river prawn. At this time, I will more focusing on whiteleg shrimp (P. vannamei) and black tiger shrimp (P. monodon) because these two types of shrimp are the most consumed and traded. Next time, I will try to write more on giant river prawn. Black tiger shrimp relatively in big size, however the production in the world has decreased due to the outbreak diseases such as White Spot Syndrome Virus (WSSV) dan Monodon Baculo Virus (MBV), therefore this type of shrimp gain a higher price in the market. This shrimp also known as a “lazy” shrimp, they prefer to be in the bottom of the pond and rarely move around so they are vulnerable to disease. Broodstock of this shrimp may be obtained from the wild or from the ponds. Due to the economical consideration, shrimp farmers mostly prefer to use broodstock from the wild. 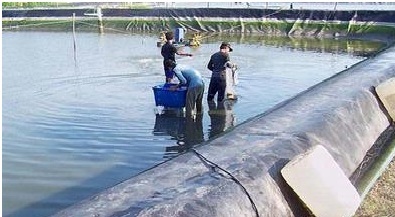 Wild broodstock give a faster turnover to farmers and produce in 4 – 8 weeks the same of larvae that ponds broodstock can yield in 8 – 12 weeks. Also pond stock requires a maturation pellet often not commercially available in addition to natural food such as squid, mussel and trash fish, whereas wild broodstock can be maintained in natural food alone. Whiteleg shrimp smaller than black tiger shrimp, however this type is the most widely produced today because even though the price is lower than black tiger shrimp, but this shrimp has a pretty good market and relatively stable. Whiteleg shrimp also “stronger” than black tiger shrimp because they are “quite active” and not easy to “stress”. Broodstock of this shrimp may also be obtained from the wild or from the ponds. Actually broodstock from the wild is better than from the ponds, however due to the consideration of water contamination resulted farmers to use broodstock from the ponds. A good broodstock must meet the criteria of SPF (Specific Pathogen Free) and SPR (Specific Pathogen Resistant). These two criteria to detect pathogens in the carrier state before the onset of disease.